What does a brand strategist do to create media endurance? 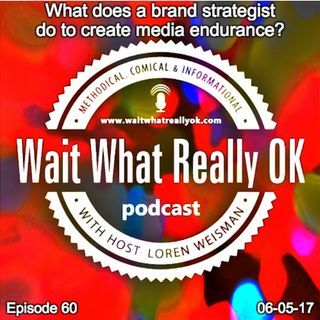 Wait What Really OK Podcast Episode 56 hosted by Brand Precision Marketing Strategist and Counselor, Loren Weisman dials in to the ideas around creating a stronger media endurance for brands. A great deal of brands lift off or are launched before they are ready. And while those brands can get a boost upon launch, they tend to not go that high and quickly crash in to obscurity. In building the brand, going deeper in to the ... Más informaciones product or the person, their past, their influences, comparisons, knowledge and background, it all opens up a greater deal of possibilities for media exposure, interviews and no cost promotional endurance options. What does working with a brand strategist do for your brand and for your media endurance? It can do a great deal to assist in keeping your messaging fresh and extended for a greater endurance in the media. By organizing your foundation for all the options of both content and promotion, you allow yourself a wider reach with more chances to convert media to sales. Ep 60 “What does a brand strategist do to create media endurance?” of the Wait What Really OK Podcast is available on iHeartRadio. Podcast Blog Supplement for Episode 60 of the Wait What Really OK Podcast with Loren Weisman. Podcast Link Supplement for Episode 60 of the Wait What Really OK Podcast with Loren Weisman. Speak as an authority from the experience and knowledge you have. Podcast Video Supplement for Episode 60 of the Wait What Really OK Podcast with Loren Weisman. Podcast Photo Supplement for Episode 60 of the Wait What Really OK Podcast with Loren Weisman.